Arrived at the lake at 9 a.m. with Robin and Josh (age 8). We fished all the way to the yellow cliffs. Fishing was a bit slow after a big tournament last Saturday. 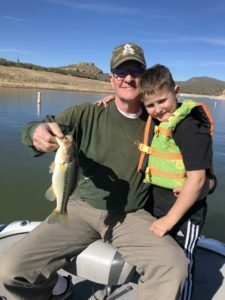 We only caught 5 total bass on drop shot using (morning dawn and oxblood) Roboworms. It was hard hooking the fish because they were not biting the worms very hard. Enjoyed fishing with this grandfather and grandson duo. Fish AZ © 2019. All Rights Reserved.